After a hectic Christmas / New Year period and good results in class national titles around the country (including Tassy), it’s now time to get back to club racing and swell those fleet numbers to ensure we stay an active and vibrant club. The work and effort that each of you do toward the club is what keeps us strong and healthy. So even if you may only do a couple of small things for the club, they are still important activities for its running. To the ‘on water’ activities – A small fleet, due to an earlier return to club racing than normal saw huey (Imaginary god who creates surf (waves, wind and associated conditions, generally used humorously) provided an exceptional day for the club, almost as a welcome back to the 2nd half of the 2018/19 sailing season. It began with a southerly at 5-8 knots in the morning for the coffee cruise to Parkdale attended by 10 sailors. It was a quick trip down in a trailing breeze that only took 15 mins then coffee and a chance to discuss ways to save the world underneath a bright blue sky and a wonderful view of Rickett’s Point to Mt. Eliza. After an hour or so, the group decided to head back for the afternoon racing. IT IS WELL WORTH THE TRIP FOR ALL CLUB MEMBERS (AND FRIENDS) TO TRY. Two races on a Windward and Return course set up the afternoon in 10 to 12 knots that persisted most of the day. A good day to wipe away the cob webs. Again, the club must once again thank the Volunteers who gave their time to ensure a most successful Australian Mosquito Title. (see the previous article in “Features” below on the MSC web site for all the details). 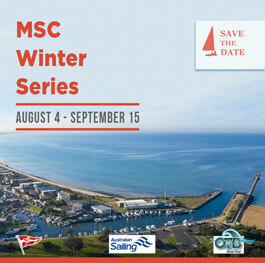 Sun 3rd Feb MSC + MMYC Regatta – Come down and help out, crew in one of the MMYC keel boats or sail your own boat.